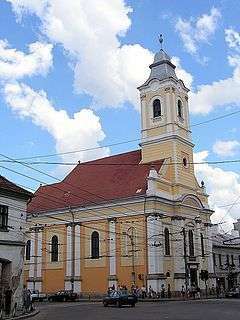 The Evangelical Lutheran Church of Romania (Romanian: Biserica Evanghelică-Luterană din România; Hungarian: Romániai Evangélikus-Lutheránus Egyház; German: Evangelisch-Lutherische Kirche in Rumänien) is a Lutheran denomination in Romania. Many active congregations were founded over 450 years ago, and today the Church has 27,540 members. It is primarily a Hungarian-speaking denomination, with one diocese for Slovak-speaking parishes. This church is not to be confused with the mainly Saxon, German-speaking Evangelical Church of the Augustan Confession. ↑ J. Gordon Melton; Martin Baumann (21 September 2010). Religions of the World, Second Edition: A Comprehensive Encyclopedia of Beliefs and Practices. ABC-CLIO. p. 1055. ISBN 978-1-59884-204-3. Retrieved 5 February 2013. ↑ "Evangelical-Lutheran Church in Romania". World Council of Churches. Retrieved 7 October 2014. ↑ "Cimtár". Romániai Evangélikus-Lutheránus Egyház (in Hungarian). Retrieved 29 August 2016.